The telling of tales has deep roots in Appalachia and the Blue Ridge region; those roots will be explored this weekend, when nationally known story tellers come together to share their craft in a festival that has been carrying on the tradition for nearly two decades. Bil Lepp has been known to tell some tall tales. In fact, he is a five-time champion of that contest. He says he builds his fabrications as his stories unfold. It’s like a create your own adventure, but he chooses the ending, to the delight of his audiences. Lepp is one of the story tellers performing this weekend at the Sounds of the Mountains, a music and storytelling festival. Alan Hoal, cofounder and committee chair for the festival. There will be a mixture of stories at the festival, including those of Gayle Ross. And, there will be personal stories and folk tales from Donald Davis and stories and music from Josh Goforth. Alan Hoal says Sounds of the Mountains carries on a long tradition. 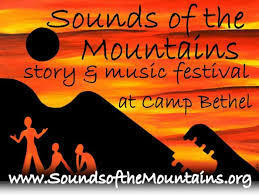 That tradition continues at Sounds of the Mountains at Camp Bethel, just north of Roanoke , Friday and Saturday. ***Editor's Note: The Sounds of the Mountains festival is a financial supporter of Radio IQ.